Bacon and eggs. Great combination. Peanut butter and jelly. Great combination. Rainy day and a movie. That too. 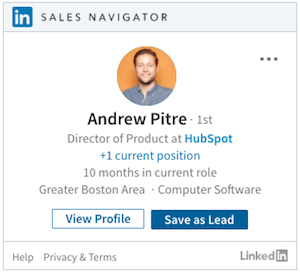 Today, a new duo joins the fray: LinkedIn Sales Navigator and HubSpot CRM. LinkedIn Sales Navigator is a powerful tool that helps sales teams to target, understand, and engage with leads and prospects. From company news to lead search and InMail, It’s a goldmine of useful tools for a sales rep. But if it lives separately from your CRM, its powers remain in a silo. For every record you pull up in your CRM, you have to open a tab (or two) to track down that lead or account in LinkedIn. And, as we all know, tabs are the death of productivity. With today’s change, the best features of LinkedIn Sales Navigator now live directly inside of contact and company records in HubSpot CRM. No new tabs, no hassle, no time wasted. Just the functionality you know and love from LinkedIn Sales Navigator, nestled right into your HubSpot database. 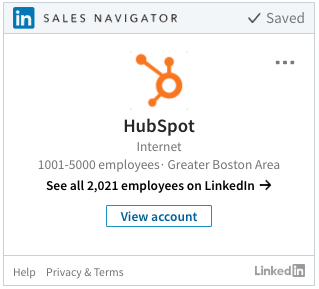 Track down related leads, mutual connections, common interests, and more, without leaving your HubSpot portal. If you’re in sales, chances are good that you already use LinkedIn Sales Navigator. If not, the quick down-low is below. If you’d prefer it in video form, hit “play” at the top of LinkedIn’s Sales Navigator product page. LinkedIn Sales Navigator is a social selling tool for salespeople. It’s a premium offering, above and beyond the LinkedIn networking tool that we all know and love. As a paid tool, it lives separately from the LinkedIn interface that you’re used to, but it includes many parallel features --- an advanced search tool that lets sales reps to find leads for outreach; an activity stream that brings together news and updates from people and companies a sales rep follows; a system for sending messages to connections, and more. Designed and built with sales professionals in mind, LinkedIn Sales Navigator harnesses the power of LinkedIn, combined with unique sales features, to take selling to a whole new level. Find and target prospects more quickly. Improve prospecting to qualify leads more effectively. Get real-time updates and alerts on leads and prospects. Shorten sales cycle with recommendations on decision makers. To set up the integration, navigate to your integration settings (your avatar > Integrations). Click All Integrations, find LinkedIn Sales Navigator, and click View Integration. Go through the authentication process with LinkedIn. Once you’ve set up the integration, navigate to any contact or company record in HubSpot CRM and you’ll see a brand new card in your left-hand sidebar. Off the bat, you’ll see a slew of useful information pulled directly from LinkedIn. For contacts, you’ll see job title and company, time in role, location, and industry. For companies, you’ll have a quick glance at industry, size, and location. In both cases, you can click over to the LinkedIn profile (lead or account). If you’d prefer to stay in HubSpot and avoid opening a new tab, click “View More,” and you’ll be taken to a more detailed view of the profile, within the friendly confines of the HubSpot record. Icebreakers: shared connections, experiences, and interests, plus a link to the lead’s recent activity stream. Get Introduced: quickly ask a mutual connection for an introduction. Related Leads: find other leads at the same company, and quickly save them to your Sales Navigator leads list. Recommended Leads: With whom in the organization do you share connections or interests? Connect with them, and start your sales outreach there. Connections: Who are you already connected with in the organization, that you might reach out to? News: What’s going on at the company? Have they released a new product recently, or hired a new executive? Use this tab to bring context to your sales outreach. 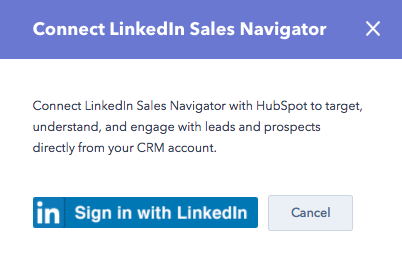 The Sales Navigator integration is now available in all HubSpot CRM portals. Note that you’ll need a Team or Enterprise Sales Navigator subscription in order to integrate with HubSpot CRM. If you aren’t yet using Sales Navigator, no better time to try it out. Sign up for a free trial now.